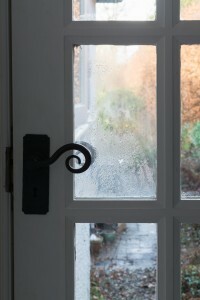 Condensation in double glazed units: The difference is clear to see! 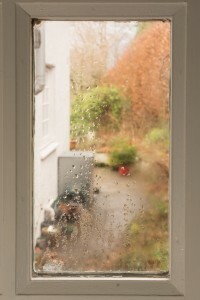 If you can see condensation inside the cavity of your double glazed units, we are here to help! Condensation inside the unit can indicate that it is no longer sealed. Any damp air entering through the seal may then form condensation inside the unit. It is a misconception that the whole window needs to be replaced if this is happening. Actually, if the window frames are in good health then you may only need replacement units. This can improve the appearance and energy efficiency of your property at a fraction of the price of new windows. In most cases we can offer like for like replacement glass. Alternatively, if you are looking to upgrade your glazing we have plenty of unit specifications on offer! We have many years’ experience glazing into wood or PVCu frames and we can manufacture units in a huge variety of specifications and with lead, Georgian bar or authentic bar detail. 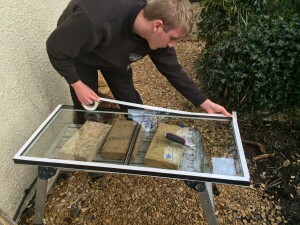 Once we glaze the replacement units, we will guarantee them for up to 10 years (subject to terms and conditions). So if you would like a clearer view from your windows, or are looking to upgrade your glazing, let us know! ...on 01460 73570 to arrange for our Surveyor to pop out to your property and take measurements for a free no obligation quote. He will then report back to us here at the office and we will be in touch with a quotation as soon as possible.